At United Way of Central Iowa, we lead the fight for the health, education, and financial stability of every central Iowan. We bring together donors, volunteers, businesses, nonprofits, faith-based, community leaders, government, experts, and those in need. Together we seek out central Iowa's toughest challenges, set sound strategies and goals, and then tackle them at their roots... in a UNITED WAY. But that still may not answer the question "What do you do?" We bring together community stakeholders like our donors, volunteers, businesses, nonprofits, faith-based, community leaders, government, experts, and those in need to identify challenges in the areas of Education, Income and Health. Each challenge is broken down to its root causes, and together United Way and the stakeholders develop research-based comprehensive strategies to make significant and sustainable progress on addressing central Iowa's toughest issues. Once the strategies are set, it's time for action. We invest in or create initiatives designed to move us steadily toward the goals for 2020. We convene coalitions, advocate for public policy, raise awareness and mobilize volunteers. We create metrics and continuously measure and evaluate the results of these investments, holding every initiative accountable to ensure they are making real progress. The goals for 2020 are not aspirations, they are destinations. To increase the percentage of central Iowa students who graduate from high school to 95% by the year 2020. To increase the percentage of central Iowans who are financially self-sufficient to 75% by the year 2020. To increase the Central Iowa Gallup Healthways Well-Being Index score to 64.5 by the year 2020. The funds raised by United Way of Central Iowa—over $27 million in 2016—are invested in various programs and initiatives to attack the very real challenges that people are facing right here in central Iowa, which is why real people just like you help determine where those donations go. All investment decisions for the funds raised are made by groups of volunteers called "Cabinets." Our investment Cabinets are made up of local experts in the areas of Education, Income and Health in central Iowa. To learn more about how the dollars our generous donors provide are invested to improve lives in central Iowa, click the "How We Invest" button below. Each year United Way leads the fight for the health, education and financial stability of all central Iowans by working toward the Community Goals for 2020. The Community Impact Report, is published each year at the annual LIVE UNITED luncheon, provides updates on progress made toward the community goals for 2020, as well as highlighting the key focus areas in each category of EDUCATION, INCOME, and HEALTH. Specific initiatives and the results they have produced are also included. 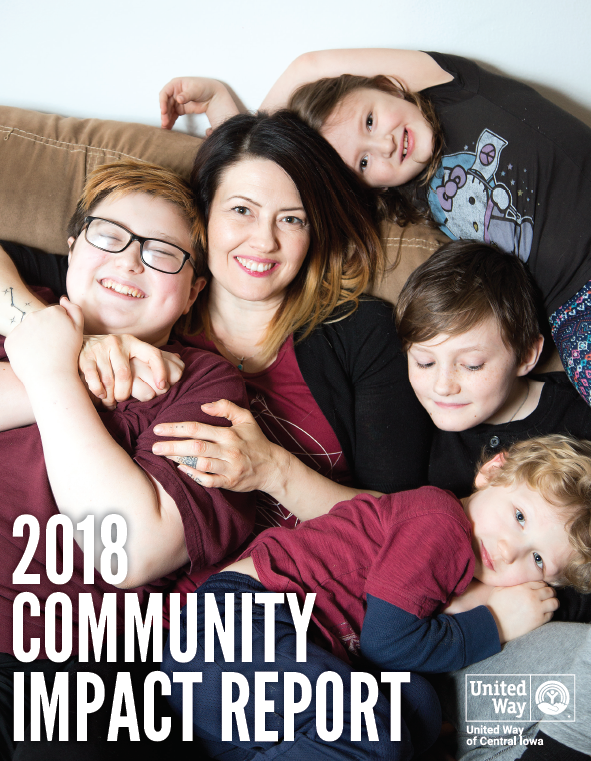 View the 2018 Community Impact Report online, or click below to download a PDF copy of this year's report. Similar to 9-1-1, this phone number is set up so central Iowans can dial 2-1-1 for help accessing assistance programs for things like housing, transportation, food, childcare, healthcare and more. The ACEs toolkit helps organizations and service providers identify various types of trauma, recognize how events from childhood may be shaping peoples' responses and provide guidance to help them address these challenges. Bridges to Success is a 5-year initiative to help thousands of central Iowans earn their High School Equivalency Diploma (HSED) and gain the skills, training and confidence needed to lead better lives. The Building New Careers program serves to identify, screen, assess, and recruit low-income adults for entry into one of 18 apprenticeships with the Building and Construction Trades. The Central Iowa Works program is designed to help close the skills gap and meet the needs of employers by helping them to recruit and hire qualified workers for a variety of jobs in central Iowa. The Financial Capability Network provides low to moderate income individuals and families a pathway to financial literacy and financial inclusion, with a goal of helping achieve financial stability and independence. Corporate and Community Giving Gardens promote and provide access to local produce for low-income central Iowans by growing, harvesting and/or rescuing unused food to be distributed to those in need. The HOPE Initiative removes barriers for single parent families through a multi-generational, integrated, and comprehensive approach designed to connect them with a spectrum of education, income and health resources. This summer program is designed to help students avoid a backslide in the learning, to provide opportunities for education, physical activity and access to healthy food, and provide parents a variety of services as well. READ to SUCCEED is a groundbreaking, community-wide awareness and action campaign to help kids read proficiently by third grade. There are multiple ways you can get involved in this effort: donating books, building literacy kits, reading to children, advocating for summer reading programs and more. Over the past year, community members have come together to develop and refine a the Central Iowa OpportUNITY Community Plan to take action against poverty in central Iowa. 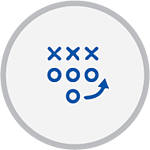 The plan's goal is to have a realistic game plan of actions, big and small, that can bring financial stability and prosperity to the one-third of central Iowans who live in or near poverty. and ethnic groups living in central Iowa, shared success stories and provided resources for the refugees suriviving and thriving among us.